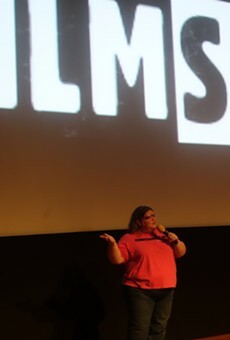 Jen Vargas addresses the FilmSlam crowd after being introduced by outgoing director and host Tim Anderson. After six years at the helm of the Enzian Theater’s FilmSlam, Tim Anderson has handed over the duties of director and host to Jen Vargas. 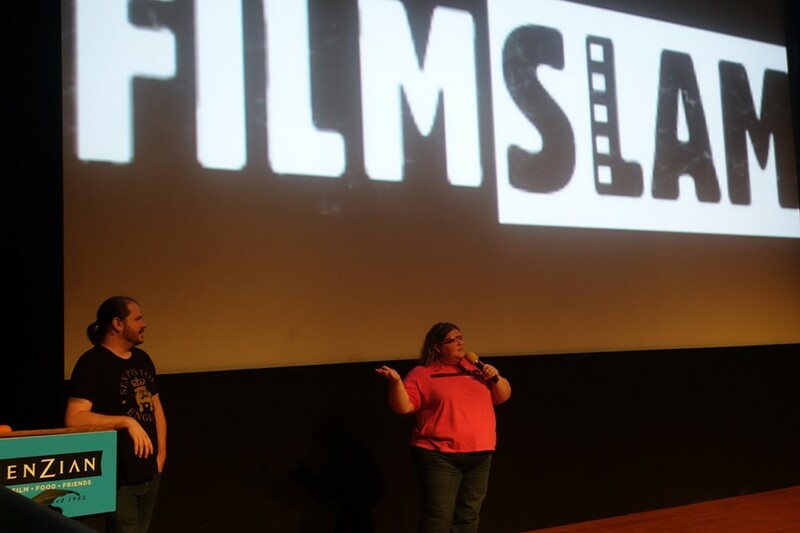 FilmSlam is a monthly competition featuring student, independent, low-budget and no-budget short movies made by Florida filmmakers. It’s held on the second Sunday of each month, and the monthly winners (as long as they are less than 10 minutes) move on to the Brouhaha Film & Video Showcase each November, with the best of those playing the Florida Film Festival the following April. Last Sunday’s event, which saw Benjamin Gill’s absurdist short film, Babies, take top prize, was Anderson’s last. There will be no FilmSlam in November (to make room for Brouhaha), so Vargas will take over in December. Anderson took charge of the event in late 2009, three years after it moved from the Downtown Media Arts Center (DMAC) to Enzian. He is leaving to concentrate on his new full-time job as programming coordinator of Enzian and the Florida Film Festival. Vargas is no stranger to the local film scene. In addition to being the managing editor of Central Florida Top 5, she serves on Film Florida’s marketing committee and on the Florida board of Women in Film and Television. She’s also been involved with FilmSlam in many capacities over the years, going back to the DMAC days. But Anderson won’t be leaving FilmSlam entirely. Though Vargas paid an emotional tribute to Anderson on Sunday and says she has no plans to change the FilmSlam format, she says she’d like to expand the event’s social-media outreach and involve more filmmakers. She also admits she’s both honored and a tad anxious about taking the reins from Anderson. “I’m feeling more nervous than I thought I would, but I’ve been part of this event since even before Tim was part of this,” she says. “I went to a couple [of FilmSlam events] at the DMAC, … and then when it moved here to Enzian, I just started coming and didn’t stop. What most people don’t know is that I’ve been helping with the social media since Tim took over, so I’ve had sort of a relationship with FilmSlam already. Despite the talk about FilmSlam’s future, Sunday was more about paying tribute to Anderson and, of course, the filmmakers who make the event possible. For more information on FilmSlam, visit www.enzian.org/festivals/filmslam.